So apparently CampNano has come quite a way since the last time I participated. Now, not only can you choose your own genre, you’ve got a much more varied selection of categories, including a “revision” option. Along with the fact that I can change my “word count” goal, I might just wait until July starts to start working on editing Ashes. One hour of editing equals 1,000 words, so I’m pretty sure I can find the time to do at least 25 to 30 hours of editing, even with class everyday and working. And on that subject, does drawing a big, giant X over multiple paragraphs count as editing? Because that’s what I feel like doing with parts of this work. I’m going to wind up scrapping whole pages of this piece, I’m pretty sure. I’ve already taken out whole chunks of the outline. I’m also hoping to make the chapters shorter, too. When I put the current version of the document into the formatted 6″x9″ form, the chapters have gotten way too long. So, at this point, I am giving serious consideration to doing CampNano. If anyone is interested in adding me as a friend there, or sharing a cabin, feel free to send me a message, either here or on there. My author name is MayuuyaHakusho there, too. In other news, I have a new little writing area. I did away with my drafting table in favor of a writing desk, since I’ll get more use out of a desk, I think. The desk came from my grandmother, the same one that passed away last november during NaNo, as did the two lamps on either side of it. 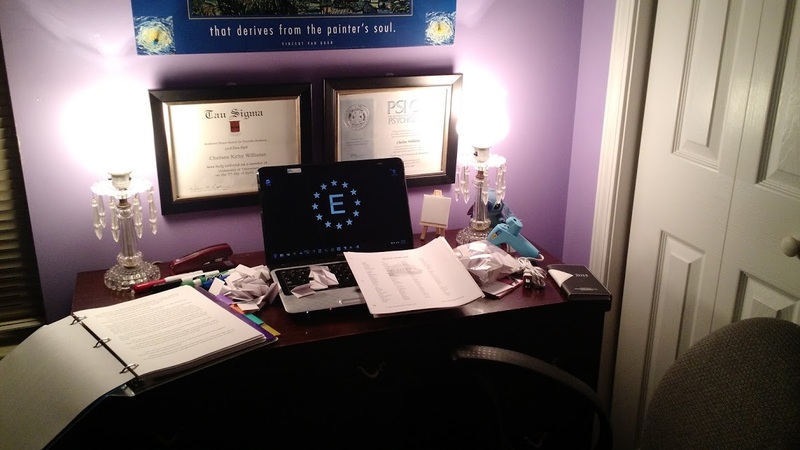 It isn’t usually quite this cluttered, since I’m actually a bit of a neat freak about my work spaces like this, but I was working on several things at once when I took this picture. The little folded up things that are spread around on my laptop are a series of like 100 or so prompts that I found online and put on to little half size notebook cards then folded and put into a bag to use if I need them later. The desk is a bit small, but it suits my needs for the time being.